Korma, Kheer and Kismet: Five Seasons In Old Delhi is a record of the food experiences offered in the streets of Old Delhi. Pamela Timms came down all the way from Scotland to enjoy the tastes and flavours of Indian food, which she found it in the street food stalls. Pamela Timms is a journalist from Scotland. She has written for numerous publications. She came to India to discover its wonderful and varied flavours. 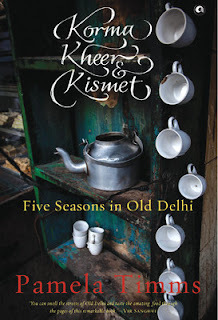 Korma, Kheer and Kismet: Five Seasons In Old Delhi is a record of her experiences exploring the street food stalls of Old Delhi. She now records her foodie experiences regularly in her blog, Eat and Dust. Pamela Timms now lives in Delhi. She is married and has three children. When I received this book there are two things that caught my attention. One was ofcourse the beautiful cover - it almost made me Time Travel. The second thing was the bunch of post its inside the book. Yes that is the beauty of receiving a book from a book club where before you there have been some people who have read this book and have also spared some time to pen down their thoughts at various pages on these post-its. It was an experience I cannot put to words. I was overwhelmed, touched and most importantly moved. Imagine a single book evoking so many emotions in different people , that is the power of the written word. A travelogue, a food guide , a memoir, a biography and a cook book is how well this book can be described. Coming to the book - I loved loved loved loved it. I have spent my childhood in Delhi and have some very fond memories of those lanes full of delicious aroma. I loved seeing Delhi from the author's perspective.It made me notice a lot of things which perhaps I would not have, like that 200 years old attar shop in Old Delhi who has a perfume that resembles petrichor. And it is these minutely beautiful observations which make this book a real treasure to have. I also tried each and every recipe she has mentioned in the book (No wonder this review is late!!) and yes they did turn out very well... well almost, they can never be as good as the street food. But it was fun trying to recreate something and smile as you eat it remembering old times. Her recipes are also very easy to follow and hence give results without fail. The only minus is perhaps the quality of the pictures, that is something I was very keen on but was tad disappointed. Having said that, the book is still a wonderful read. Strongly recommended for one and all, you don't know what you are missing out on. This book is like pootharekulu (well being a food book it does need a very unique dish!) 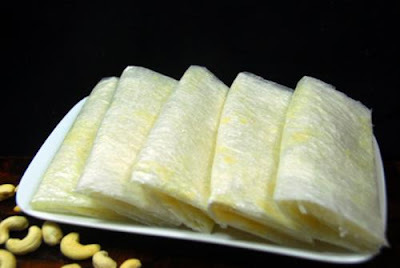 - soft, sweet, melts in mouth, is unique and ofcourse something you must have atleast once in your life.